Four female students of the government secondary school Chibok, who were abducted by gunmen and reunited with their families, walk in Chibok, Nigeria, April 21, 2014. 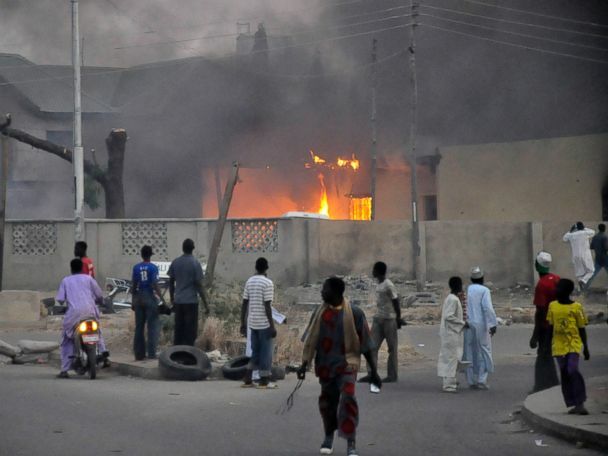 In this April, 21, 2014 file photo, security walk past burned the government secondary school where gunmen abducted more than 200 students in Chibok, Nigeria. This grab from an undated video clip that aired on Good Morning America on May 6, 2014 reportedly shows Abubakar Shekau, the leader of the extremist group Boko Haram, giving a speech at an unspecified location regarding the schoolgirls who were kidnapped in Nigeria in April, 2014. A police officer stand guards during a demonstration calling on government to rescue kidnapped school girls of a government secondary school Chibok, during workers day celebration in Lagos, Nigeria, May 1, 2014. Women attend a demonstration in Lagos, Nigeria calling on the government to rescue kidnapped school girls of a government secondary school in Chibok, May 5, 2014. A woman attends a demonstration calling on the government to rescue the kidnapped school girls of a government secondary school Chibok, outside the defense headquarters in Abuja, Nigeria, May 6, 2014. 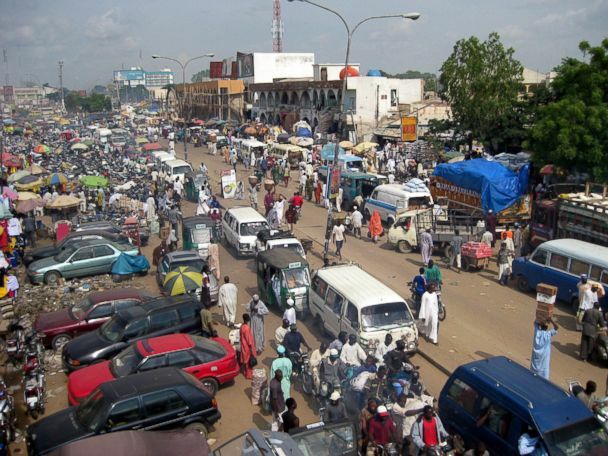 Their plight and the failure of the Nigerian military to find them ? has drawn international attention to an escalating Islamic extremist insurrection that has killed more than 1,500 so far this year. Brig. Gen. Chris Olukolade, Nigeria's top military spokesman, speaks to people at a demonstration calling on the government to rescue the kidnapped school girls from the Chibok government secondary school, outside the defense headquarters, in Abuja, Nigeria, May 6, 2014. 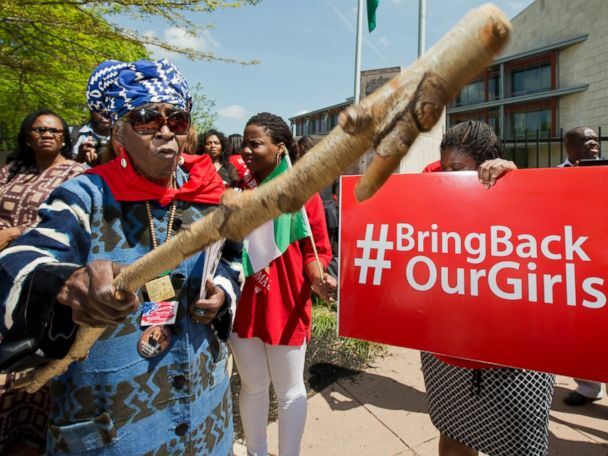 Mia Kuumba, a resident of Washington, D.C., brandishes a wooden stick during a rally in front of the Nigerian embassy in Washington, May 6, 2014. 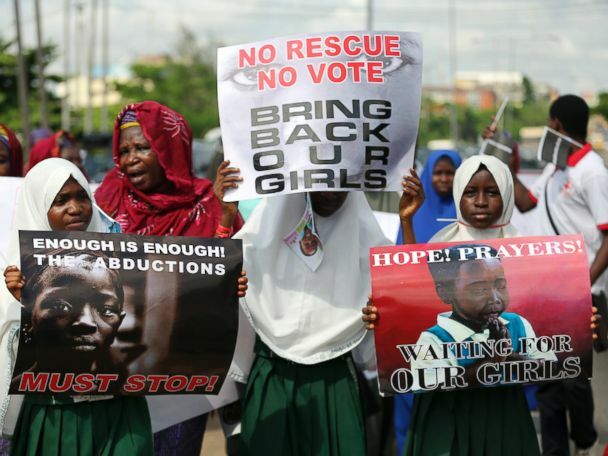 Ramaa Mosley, a Los Angeles director and mother of two, is working to raise awareness about the kidnapped Nigerian school girl using the viral Twitter hashtag #BringBackOurGirls. In this photo taken May 5, 2014, mothers and some of the kidnapped school girls from the government secondary school Chibok, who managed to escape, gather under a tree prior to the visit of Nana Shettima, the wife of Borno Governor in Chibok, Nigeria. In this photo taken May 5, 2014, Nana Shettima, the wife of Borno Governor, Kashim Shettima, center, weeps as she speaks with school girls from the government secondary school Chibok that were kidnapped by the Islamic extremist group Boko Haram, and later escaped in Chibok Nigeria.